TL;DR – Facebook, 3 years ago. Cars still have a little way to go. All hail Zuckerberg. Remember the Diffusion of Innovations model? At its most basic, it’s a normal distribution ‘bell curve’ that divides market penetration into five key adopter groups – Innovators, Early Adopters, Early Majority, Late Majority and Laggards. 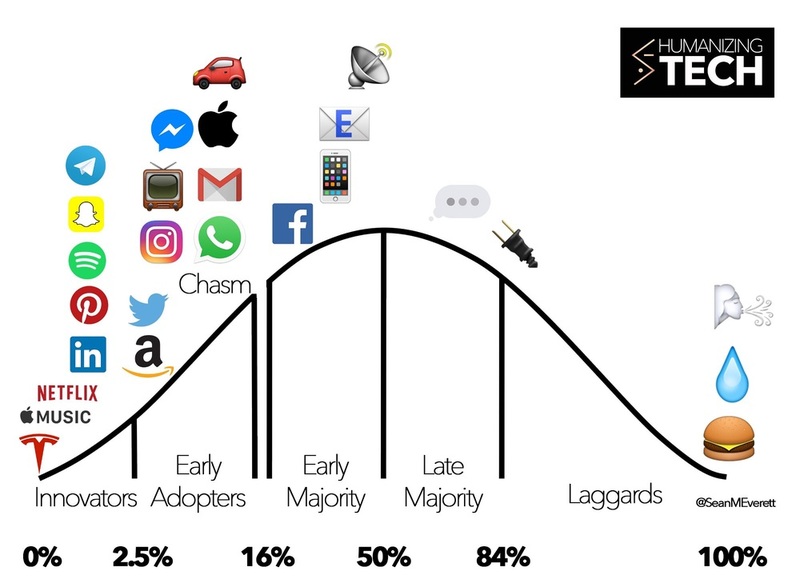 Sitting at 16% penetration (the divide between Early Adopters and Early Majority) is the fabled ‘chasm’ or ‘tipping point’: the jump that a technology, innovation or product makes to move from ‘niche' to mass-market. Generally, we see products and technologies mapped on this curve in relation to their penetration within a particular market (e.g. the US), whereby most major tech brands (e.g. Instagram, Netflix, etc.) are comfortably in the mass-market region. But what happens if you map these brands or technologies based on their global penetration? Driven by his own curiosity, this is precisely what AI researcher Sean Everett has recently calculated, and presented in a recent opinion piece on Medium. Looking at the bell curve model in relation to the global population, Everett has calculated that a technology or product can be said to have reached mass market status once it exceeds approximately 1.2 billion active users. So which modern technologies fall into this category? Well it’s generally what you’d expect – wide-reaching technological platforms such as Radio, SMS, the Internet, Email, and even Smartphones. Oh that’s right, and Lord Zuckerberg’s increasingly omnipotent Facebook. Yep Zuck’s blue empire crossed the 1.2 billion mark back in 2013, and at 1.65 billion active users today it’s approaching 25% penetration. To put that into perspective, there’s an estimated 1 billion active cars on the road today – which puts cars at about 13% penetration, and still a little way off that mass market tipping point. Also sitting at about 1 billion active users are Gmail, Apple products, and WhatsApp (yet another pillar of Zuck’s empire). Then sitting under them, at less than 10% global penetration are some of the other big hitters – Instagram (yep…), Spotify, Amazon, Twitter, etc. And then at less than 1% penetration are other seemingly massive players such as Netflix and Snapchat. From a tech point of view this really puts things into perspective, and displays the true power and influence of the ever-expanding Facebook empire. To take this one step further, whilst Facebook do not seem to disclose their total unique active users across all of their platforms (Facebook, WhatsApp, Messenger, Instagram), we can quite easily assume that they’ve passed the 2 billion mark. Just think about that from an advertising perspective. There’s over 2 billion people that Facebook could individually serve advertising to. It’s probably time we reconsidered the importance of Facebook in our communication strategies. In a fantastic post on Medium, Twitter's James Buckhouse explains his powerful 'story map' UX visualisation technique that will change the way we pitch a UX idea to clients, developers and more. But what is a story map? "A story map is a new type of design document that shows the big idea of your product experience at a glance. A good story map is your golden ticket to unify your team, secure executive support, and help you find a way to ship. Halfway between a storyboard and a treasure map, it bundles the value and functional flow of your product with the delight people might feel at each step in your product. It sketches the UX flow without locking it down, and it delivers the gist of an idea and the emotional gestalt without prematurely belaboring the details." Bud Cadell has created a 93 slide presentation outlining the current state of digital strategy, exploring core concepts, deliverables, and thought-leaders. Covering everything from 'What is a Digital Strategist?' to 'What does a Digital Strategist produce? ', it is a simple read that can help client and agency folk better understand digital strategy (and the role of a digital strategist). Plus it is a great source for key definitions. Equipped with this deck, even the least digitally-minded should be able to have a fair crack at a digital strategy! Once again, another great contribution from Bud Caddell. By the mid-1980s the PC market was growing rapidly, with multiple manufacturers offering clones of IBM-style computers for both personal and professional uses. Since most consumers were largely uneducated in the new technologies, machines were mass-produced in ‘models’ and distributed quarterly in large quantities to a supply network of retail outlets. Whilst this method proved effective, it was ultimately a highly inefficient sales model due to rapid advancements in technology quickly depreciating large inventories of machines (Mills & Camek, 2004). Resultantly, a new manufacturer, PCs Limited, entered the market in 1985 selling computers directly to consumers through magazine advertisements (Dell, 2012). The company, renamed Dell in 1988, pioneered the ‘configure-to-order’ direct-to-consumer sales model in the PC industry, and enabled consumers to circumvent retail outlets by ordering custom-built machines over the telephone or via the Internet. In eliminating intermediaries in PC distribution, Dell would manufacture only what was ordered, using the latest hardware, and never waste finances on owning depreciating inventory in retail outlets, a business model that lead to its huge growth in the 1990s and 2000s and to become the world’s largest PC manufacturer for several years. Following an approach established through decades of static mass media marketing, a substantial proportion of advertising campaigns are still based upon a passive audience model and fail to take advantage of the interactive and integrative capabilities of new technology. Despite the potential for high-involvement communication through today’s expanding media platforms, consumer engagement is still one of the greatest challenges facing marketing. As the pinnacle of traditional mass media, the television is the epitome of the one-to-many communication model that has enabled advertisers to produce and deliver static messages to a captive audience of millions worldwide. However, much to the dismay of many in the advertising world, this model’s heyday has come and gone as the proliferation of digital media and the Internet over the past two decades has led to drastic changes to our media consumption habits. In 2010, The Coca-Cola Company announced their ambitious ‘2020 Vision’ – to double global sales by the year 2020. As the largest beverage company worldwide, and with a wide product range available in practically every store, café and restaurant across the globe, doubling sales will not be a simple task. Over the past 100 years, the company has combined two primary marketing philosophies to achieve their market dominance: firstly, and perhaps most importantly, Marketing 1.0 style rapid and powerful increases in distribution; and secondly, a Marketing 2.0 style philosophy, building connections to customers through their mission to spread happiness and optimism, which has been present in all of their global advertising and marketing material. However, the company has identified that whilst these two present initiatives will continue to steadily boost sales, they are still not a strong enough force to create such a drastic change as doubling sales within 10 years. Therefore, in order to achieve this vision, Coca-Cola intends to be one of the first major global corporations to leverage the power of a fully implemented Marketing 3.0 philosophy. A number of common themes resonated across the various industry panel discussions of Advertising Week 2011; namely, the creation of branded content, project sustainability, innovation, risk and failure, collaborative branding, and segmentation and targeting. Much like Kevin Robert’s critically acclaimed Lovemarks, Dr. Byron Sharp’s most recent book How Brands Grow is quickly becoming mandatory reading for marketing professionals across the globe due to its eleven controversial propositions, based upon analysis of over 40 years of consumer and market research, that go against the grain of many current theories in brand marketing. According to Sharp, modern marketing is at a similar level in theoretical development to medieval science, with many practitioner-developed theories based upon untested empirical observations or assumptions. Sharp even goes as far as to say that many of the well-known marketing laws taught in business schools and books are incorrect or inaccurate, some having been conceived for the sole purpose of selling books with new content! Audience engagement has quickly become a key concept in the online arena, with everyone from multimillion-dollar brands to mom bloggers carefully monitoring their audience statistics and making increasing engagement a primary objective within their social media strategy. But why should this effort to encourage and increase engagement be limited only to online media? Can’t the basic principals we have learned to engage audiences online be brought back to traditional media? Globally, which has become mass-market first: Facebook or cars?